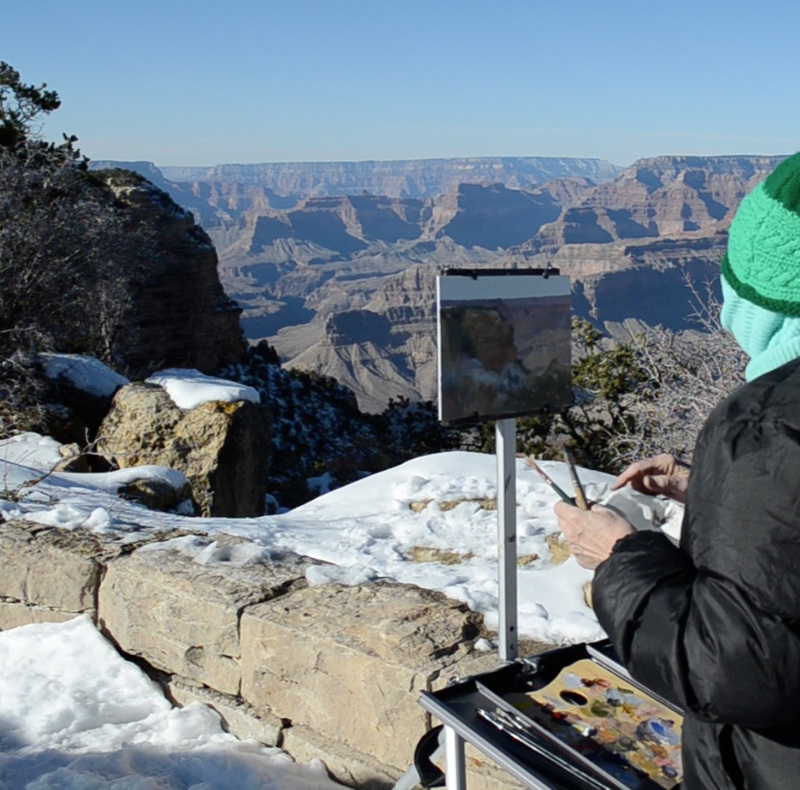 The great thing about painting at Grand Canyon is that there’s a scene practically everywhere you look. The sculptural forms of the plateaus and cliffs constantly change color as the sun moves – which adds to its beauty and provides entertainment and frustration for the artist. 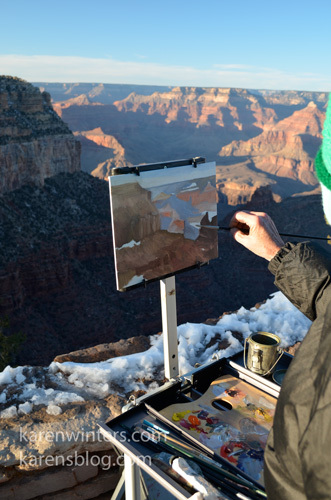 Our first days at the canyon we looked for locations to paint, then returned on the third day to some favorite spots. 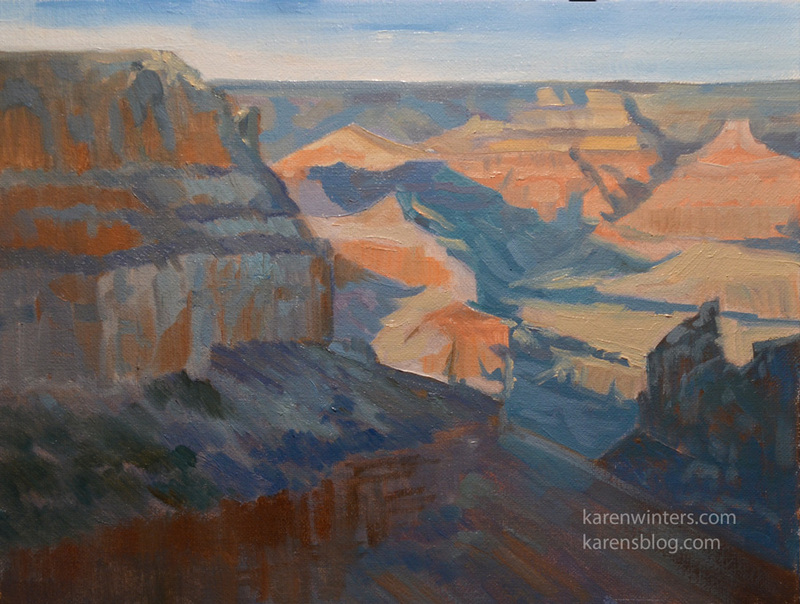 My location for this painting was somewhere between Hopi Point and Powell Point on the south rim, rim trail. The photo below shows a good example of the difference in color temperature between seeing a painting outdoors and indoors. The photo above was taken under indoor light (as it will be seen in a home or office.) Below, the painting as it appeared under natural (blue) daylight in shadow. As a rule I try to always photograph a painting as it will appear under normal home or office conditions. 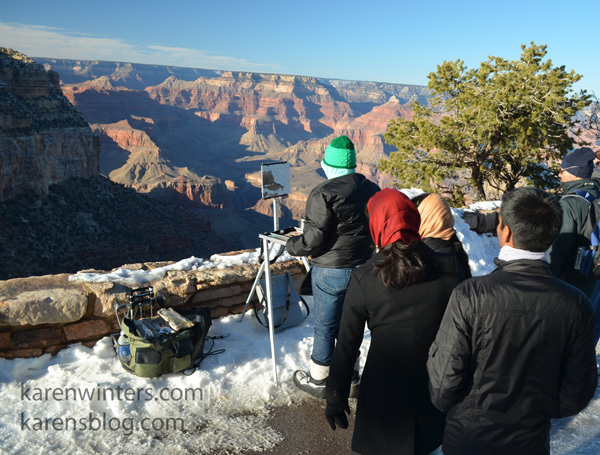 Just a few days ago we returned from a holiday trip to the Grand Canyon, one of the great natural wonders of the world. I had never seen it covered in winter snow, and I had planned ahead with all my plein air gear. It was near freezing that morning on the South Rim, which kept the snow crisp and fresh. Later in the day a cold wind moved in and I had to layer up even more. It’s surprising how cold you get when you aren’t hiking or moving around. 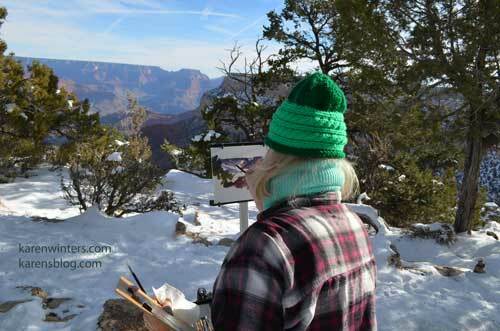 I set up my easel near Maricopa Point, on the South Rim, along the Rim Trail. In the distance you can see a bit of Wotan’s Throne, an enormous mesa that is adjacent to the north rim at Cape Royal. My husband shot some video of me working on this painting, which I’ll post when we get it edited. Because I’m almost as passionate about nature and learning as I am about painting, I found it fascinating to know that the top layers of the Grand Canyon (from the Jurassic period) have already been eroded away, so the only fossils embedded in the rocks are from the pre-dinosaur era. One finds trilobites, ferns, dragonflies, etc. but no T-rex bones. I was happy to be learn that this painting, Sculpted by Time, will be included in the 2011 Canyonlands Show at Hueys Fine Art, Santa Fe, New Mexico. 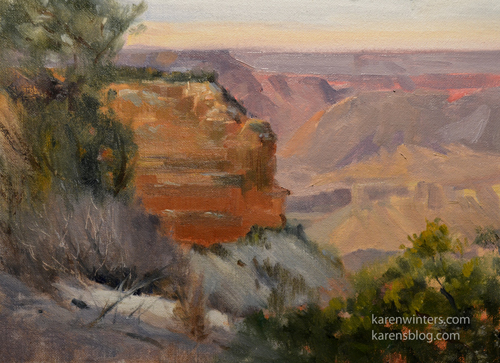 The show celebrates the beauty of the Grand Canyon and Canyon de Chelly. 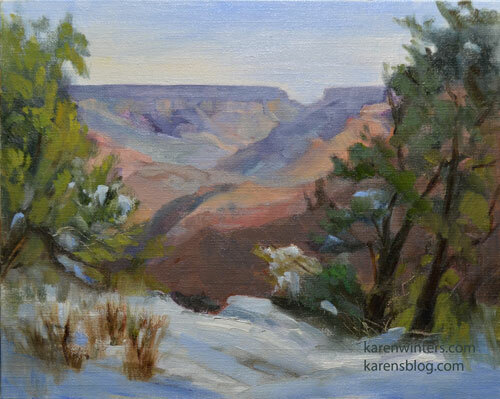 I’m looking forward to visiting the canyon again sometime this winter season – perhaps combining it with a trip through northern Arizona and/or Utah. 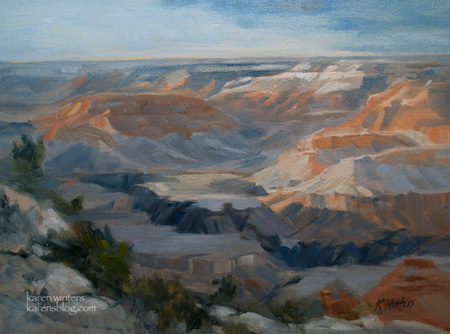 I love California but there’s a whole lot of west to explore and paint, with new vistas and new painting challenges. One of the many things I love about the Grand Canyon is the way it naturally provides complementary colors to work with – from the red rock chiseled cliffs to the blue of the sky and distant mountains.